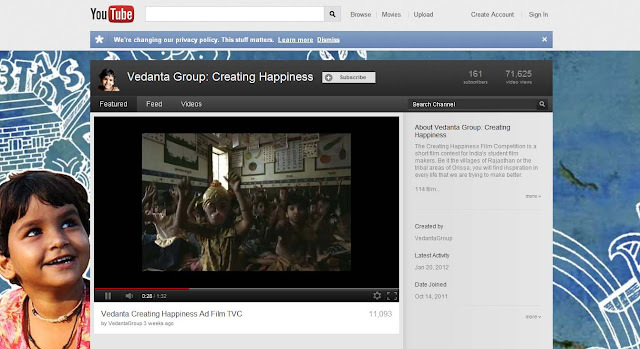 Vedanta’s Creating Happiness TV spot is undoubtedly the best of the current on-air lot. What stands out (apart from endearing little star Binno’s story) is the good intention behind this CSR campaign, coming from the largest mining company in India. The Creating Happiness website details all the commendable community initiatives and sustainable development projects that Vedanta is spearheading in local areas that they operate (in tandem with NGOs and Government). The campaign objective is to get the youth involved and create awareness about how much more needs to be done. Towards this end, Vedanta is conducting a unique Short Film Competition where college students and budding filmmakers from across India have submitted films, telling uplifting stories of families and communities in the 550 villages that Vedanta has a presence. All the 38 three minute films have been uploaded on the Youtube Brand Page for users to view and vote. The entries are well-edited and the content quality is quite good. There will be 3 winners selected by the Jury and 3 via votes on Youtube. Voting is on till March 20th. The site also has Blog posts by the participating students writing about their filming experience and what this initiative means to them. 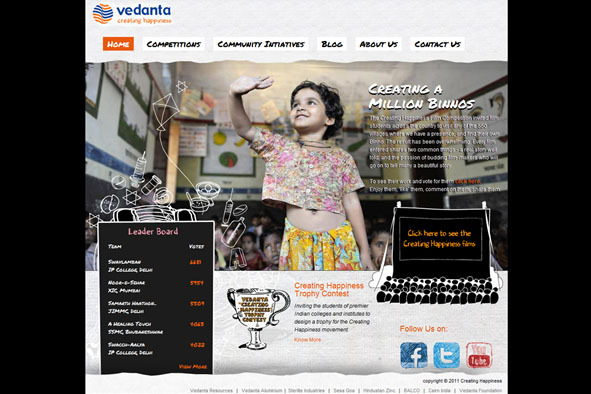 Apart from facilitating content creation, Vedanta is also inviting students to design a trophy for the winners. What an amazing campaign, end to end.